Nishta owners, Rosa and Gil. 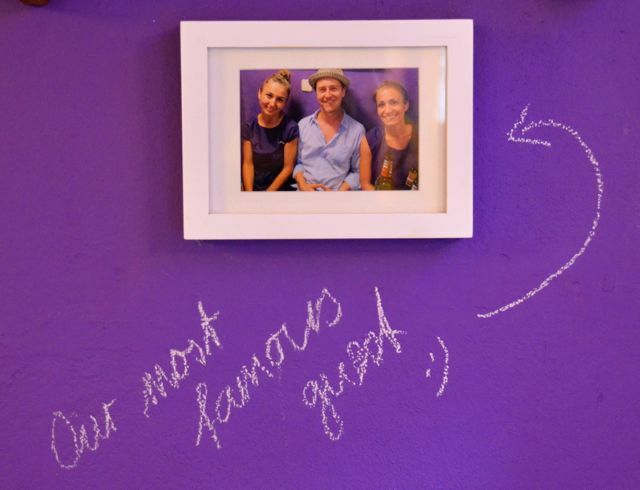 The certified chefs, who were trained in hospitality management in Switzerland, first opened a smoothie / juice bar in the city’s old town. 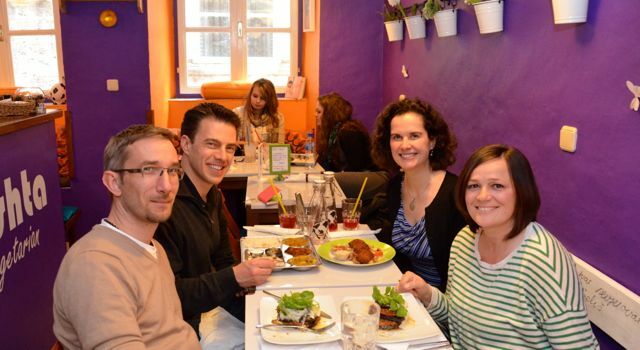 When that venture was successful, they decided to meet Dubrovnik’s large demand for vegetarian cuisine by opening Nishta Restaurant. 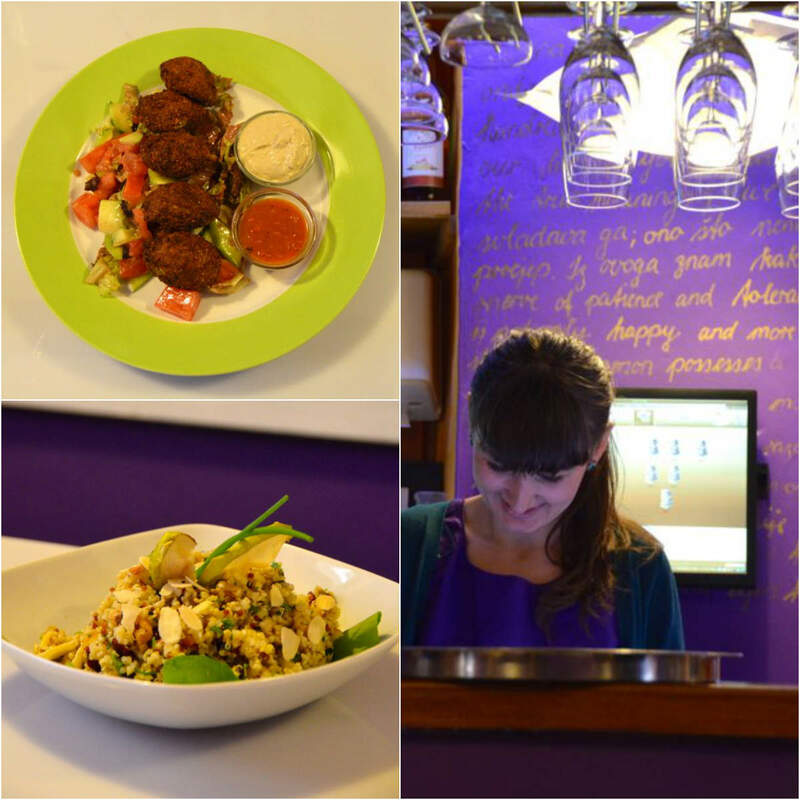 As the city’s only vegetarian spot, Nishta also caters to gluten-free and vegan diners, and those who prefer raw food. And if it hadn’t been for my recent gluten-intolerant diagnosis, I likely wouldn’t have even found Nishta’s. The first days of our Dubrovnik sojourn were overshadowed by grey skies, swollen clouds and unusual downpours. Arriving at Nishta’s on a spring Wednesday afternoon, we were instantly cheered by the restaurant’s welcoming cadre of quirky animal toys, bright purple and orange walls, and friendly owners, Rosa and Gil, and their animated infant daughter, Anastasia. As we would later discover, Shawn sat in the same seat that American actor Edward Norton did when he frequented the restaurant four times. Apparently the Nishta waitresses did not recognize Norton, but before long, they were participating in a video he was making for Harrison Ford’s birthday. Nishta’s “most famous guest” – actor, Edward Norton. We also learned that Gil and Rosa’s backgrounds are about as eclectic as Nishta’s menu offerings and decor. Gil originally comes from the French-speaking part of Switzerland, and Rosa is a Croatian who hails from Bosnia-Herzegovina, but spent many years in Switzerland. The restaurant’s name even reflects diversities. In Croatian,‘ništa’ means ‘’nothing’. In Sanskrit, the word defines an elevated state of mind in meditation. And the restaurant’s funky interior is fun and whimsical: quotes from the Dalai Lama and Croatian authors scribbled on the walls in gold ink and chalk, Barbie and Ken dolls designating the male and female restrooms, and little toy elephants, lions and frogs adorning the tables to tempt young passersby. Sitting down with the young family, we quenched our thirst with a homemade iced tea infused with berries and mint. The red tea was served in a quirky milk bottle adorned with a happy cow. It was quite tasty, and I was impressed to hear that the beverage blends are constantly changing. As we perused the menu, overwhelmed by the plethora of imaginative choices, we sought Gil and Rosa’s advice. I finally decided upon the Crazy Nuts & Grains starter and the Falafel. The starter dish was a buckwheat and quinoa salad, tossed with rocket lettuce, dried apricots, figs, plums, cranberries and almonds. It was light and tangy, with a nice texture and aroma about it. I found that the chewy almonds complemented the tender quinoa well. The dish was garnished with fresh mint. It didn’t seem possible that gluten-free eating could be so flavorful. I was euphoric. Shawn chose the Simplicity as a starter and the Indiastic as his main course. The Simplicity dish – raw zucchini ‘spaghetti’ and three delicious sauces. Find the recipe below. When the Simplicity dish arrived, I wanted to spirit it away from Shawn. 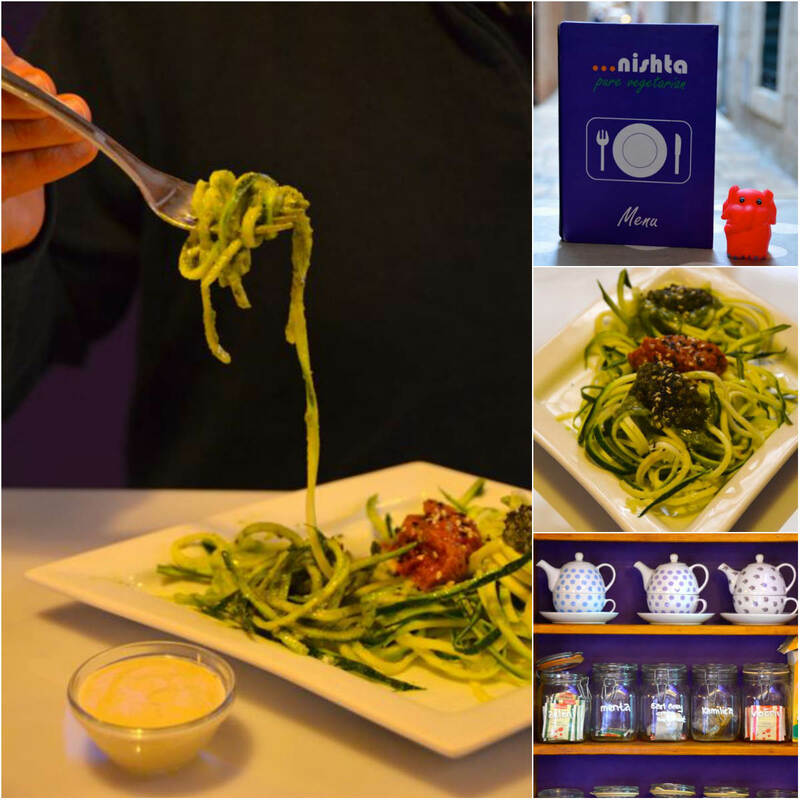 The fare was lively and inviting – colorful raw zucchini, fashioned into spaghetti-like strips, topped with dollops of three different sauces: sun-dried tomato and date olive oil, pesto, and cashew, each sprinkled with sesame seeds. As someone who appreciates meat dishes, but still survived in India for a full month eating pure-veg meals, I wasn’t sure how Shawn would react to a raw vegetable dish. Let’s just say that he liked it so much that he only let me sample a few strands of the zucchini goodness. I couldn’t get enough of the cashew-based sauce and simply must try my hand at making the Simplicity when we return home! As we enjoyed our starters, Gil and Rosa mentioned how they often encountered roadblocks when starting Nishta’s. In Dubrovnik, Gil explained, it can be difficult to source spices. In the past, he regularly travelled to India to purchase massive amounts of them. The couple has since found a supplier from Croatia’s capital, Zagreb. 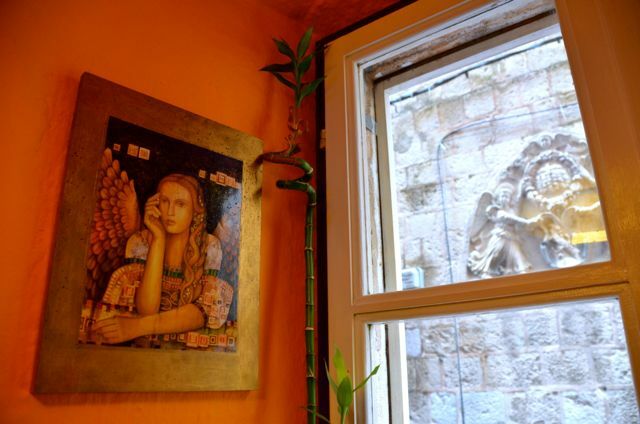 A colorful, quirky interior, and ancient art on the stone wall outside. My falafel entrée was served with a cucumber and tomato salad, hummus and a chili sauce. Since I cannot eat gluten, I didn’t order the Naan bread that typically accompanies the dish, but still I felt pleasantly full once I’d eaten the ground chickpea balls and vegetables. Shawn’s Indiastic dish was served on an authentic stainless steel thali dish that is common in India. As we soon learned, Rosa and Gil are avid travelers, who’ve spent time in India and Vietnam, two spots that we also visited last year. Their travels, they explained, greatly influenced the fusion dishes that they have created for Nishta’s. Shawn’s thali was studded with Yellow Dahl (a lentil curry), Palak Paneer (blended spinach and cheese), a vegetable curry, and served with rice and Naan bread. Though the dish was not as spicy as its subcontinent equivalent, Shawn enjoyed it immensely, and it satisfied his Naan cravings. 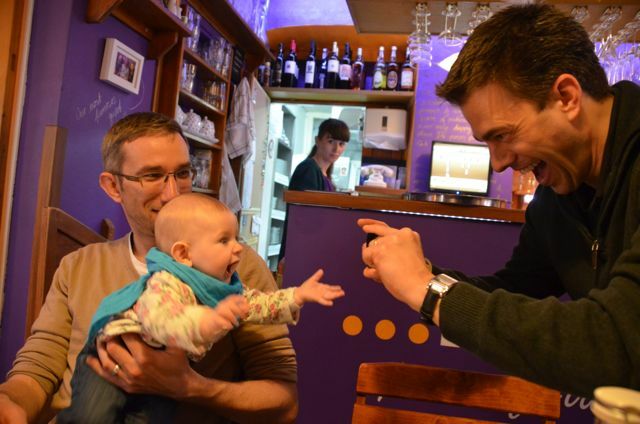 Infant Anastasia had woken up somewhere in between our starters and main course, and instantly charmed the two of us, as well as other diners. Gil moved her through the air like a little airplane. She couldn’t resist Shawn’s camera and Shawn couldn’t resist her wide smiles. We concluded that she’ll either grow up to be a great chef or filmmaker, based upon her parents’ talents and her love of Shawn’s camera. Though we were both pretty full from our first two dishes, the couple convinced us to split a dessert. Learning that the Figs in Sweet Wine offering was inspired by a northern Croatian dessert, we decided to give it a whirl. When the warm figs and lightly-spiced cream danced in our mouth, we were so glad we did. With Anastasia ready for another nap, and us thinking about one too, we bid farewell to our hosts, and strolled back into the raindrops. 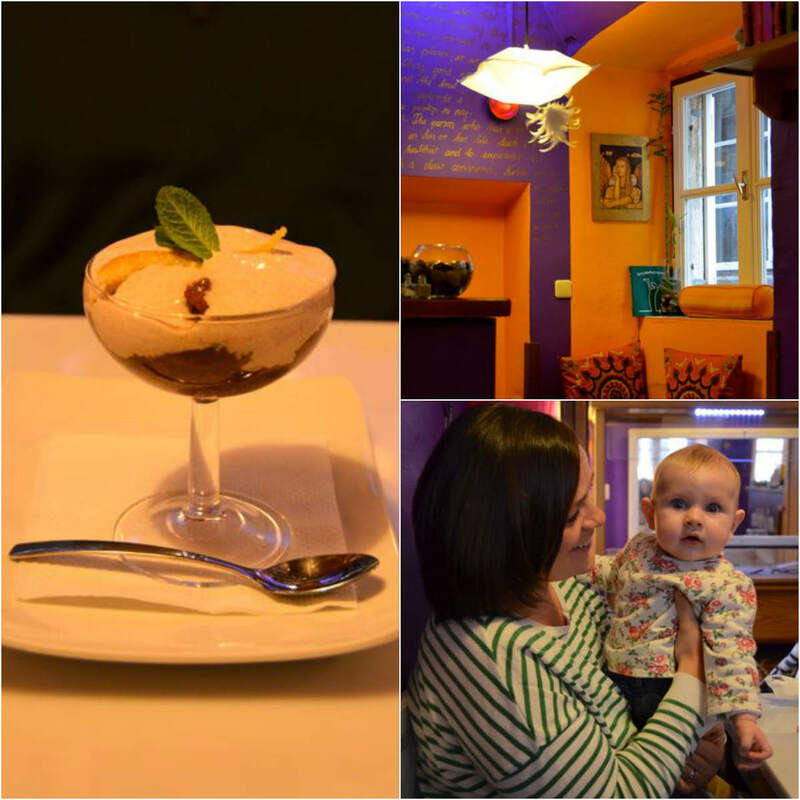 We’d love to return to Nishta’s during the summer months so that we can sample their new offerings in the outdoor seating area and just watch the world go by. To make the zucchini spaghetti, cut each zucchini using a spiral cutter for vegetables. You will need a blender to make the three different sauces. 1. Blend each sauce separately until it’s smooth and creamy. You might need a bit more or less olive oil than what’s noted in the recipe, so you can adjust for your desired consistency. 2. Separate the spaghetti into three equal portions and mix each one with a different sauce. 3. Serve them like three pyramids on a plate and garnish with fresh herbs. Enjoy! 1. Cut the figs into thin slices. 2. Put the figs, orange and lemon zest, 1 tbs. brown sugar and 1 half teaspoon of cinnamon into a small pan. Cover with water and bring to a boil. Add the sweet wine. Stir, and set aside. 3. Mix the Mascarpone cheese, whipped cream, 1 tbs. brown sugar and half a teaspoon of cinnamon into a cream. 4. Take four Muscat or martini glasses and spoon the warm fig mixture onto the bottom of each glass. Top the fig mixture with the cream. 5. Garnish with a mint leaf and some orange zest. 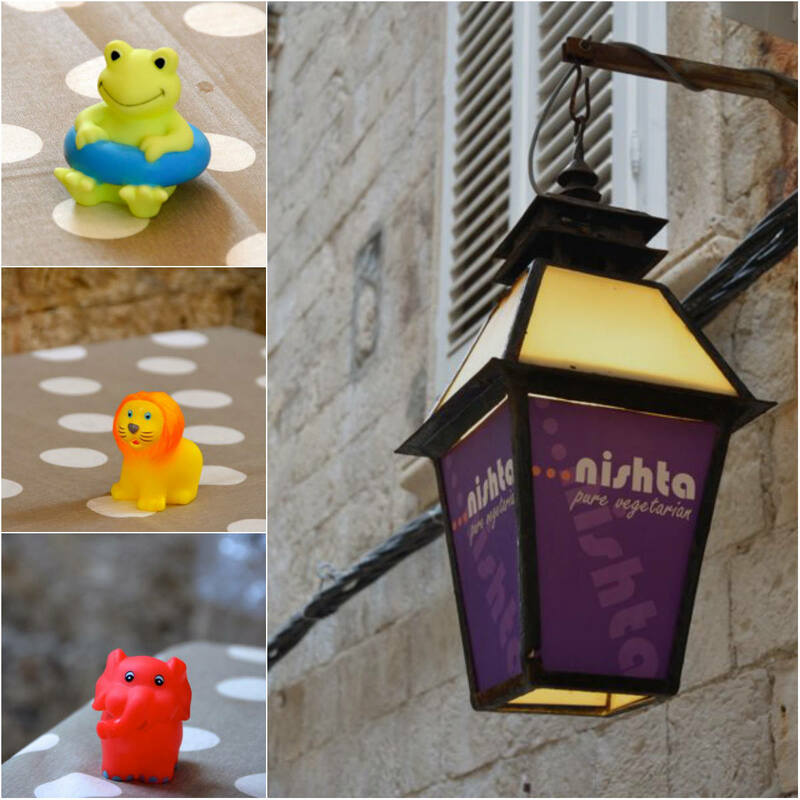 Nishta Restaurant is located on the corner of Palmoticeva and Prijeko Street in Dubrovnik. If you enter the Old Town from the Pile Gate, turn left on the third street. You’ll find the restaurant at the top of the first step of stairs on Palmotićeva Street. There is indoor/outdoor seating. We appreciated the fact that there is no smoking inside. Due to the intimate nature of the restaurant, and limited seating, it’s advisable to make reservations at least one day in advance. You can call +385 020 322 088. Also, to maximize family time for themselves and their staff, the restaurant is closed on Sundays. It is open from February through November. Our lunch was provided by Nishta Restaurant to which we extend thanks. To Gildas and Ružica, we extend an extra hvala / merci for hosting us. The dishes were fresh, delicious and imaginative, and pleasantly flavorful despite being gluten-free and vegetarian. We also enjoyed your warm hospitality and learning more about your backgrounds and life in Dubrovnik. Meeting Anastasia was, of course, another highlight! Sharon, I’ve been gluten free since last October. I’ve found it helped alleviate headaches and stomach discomfort. When traveling, it can be especially difficult finding gluten-free foods, though. When we can’t find corn noodles or special bread, I eat lots of rice. Now, we’re in Macedonia, and trying to decipher food labels written in the Cyrillic alphabet. What adventures! I’ve tried many of her recipes and loved them. Your comment about Shawn’s expressions with the little one made him smile. :) I thought the same thing too. Thanks for your well wishes, Sharon, and glad you found inspiration in Gretchen’s site. Are you noticing that there are many gluten-free substitutes in restaurants/markets in Finland? Sharon, it seems to be a good gluten-free spot then. Great news for when we finally make it there. I almost went to Helsinki on a whim about 7 years ago, but because it was winter-time, I decided to wait until the warmer months. Guess I should’ve seized the opportunity! Love Dubrovnik, it’s a photographer’s dream (as long as the cruise ships aren’t there!). Question: doesn’t buckwheat have gluten??? I agree that it’s a joy to photograph, when it’s not mobbed with visitors, Tina. :) When were you there? Quite some time ago, maybe 2009? Will post some shots one of these days. I’m thinking my husband is gluten-sensitive so will try buckwheat pasta for him. Thanks! Tina, I’ve never had buckwheat pasta, so I’d be curious to hear how it goes. My grandfather used to make buckwheat pancakes all the time though, and in Germany, I enjoyed a delightful berry cake, which had buckwheat flour as one of the ingredients. Great post, Tricia. How fortunate and fun to find this restaurant who can cater to gluten intolerant customers. The recipes sound tasty and original. Three sauces for the spaghetti is an interesting way to serve it. I will try this for sure. Ron has been gluten intolerant for over 20 years and am always on the look out for something new. Lynne, interesting to hear that Ron is also GF. If it can be challenging finding GF options now, I can only imagine what it was like 20 years ago! Do you have any websites that you particularly enjoy perusing for recipe inspiration? If you’re looking for more recipe ideas, I shared my friend’s blog address with Sharon (Aleafinspringtime) and Tina below (Kumquat Blog). She has some good stuff there! Gluten free, that must have been heaven for you, Tricia, great post too!!! It’s a miracle!! I had that fig dessert there about a year and a half ago and haven’t stopped thinking about it. I can’t believe a recipe for it is out there! Thank you SO much! As they say in Croatia, dobar tek – enjoy! I’m getting hungry just thinking of the dessert.